“I am an urban sketcher, illustrator, and artist who works primarily in watercolor, pen, and ink. I grew up in India and now live in San Jose, California. My body of work varies widely in subject, but it all ties back to a single, underlying aim: to view and to capture the world around me as a traveler would; to see both the everyday and the exotic with wonder, and to look deeply at the old and the new. I believe my love for vibrant color and for capturing action and activity comes from growing up in Mumbai, India, one of the most populated, crazy and vibrant cities in the world. I also love capturing old structures that hold sometimes unknown stories. Currently, I am working on a project called Vintage Signs of San Jose, where I sketch the fast disappearing vintage signs in San Jose. I am also collecting my sketches from my trips to India into a book. “I’m immediately drawn to the characters left foot or the one closest to the bottom of the page. You tell so much in so few strokes and I really get a sense of the bones that construct that foot which is awesome. You’re also doing a really great job with the lighting in this area, with a layering of those three colors. I’d like to see you play a bit more with the composition next time as it is a bit center heavy, kind of horizontal and isn’t drawing me around the page as much as I would like to be. Foreshortening would also be a really interesting challenge as i’m reading the feet to be a bit higher towards the surface of the water, due to the way light is captured on it, then the rest of the body and I’d love to see this exaggerated. 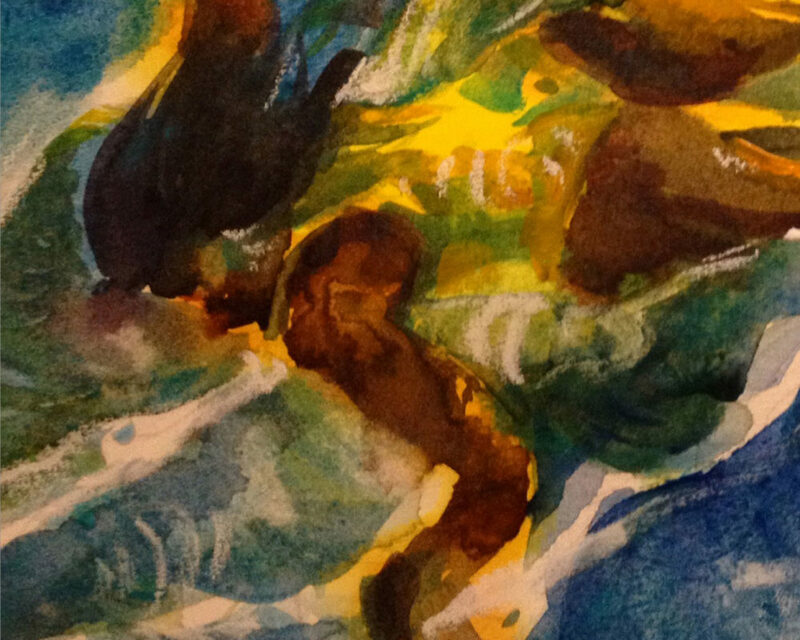 5 responses on "Suhita Shirodkar"
Wonderful use of the watercolor within this piece! 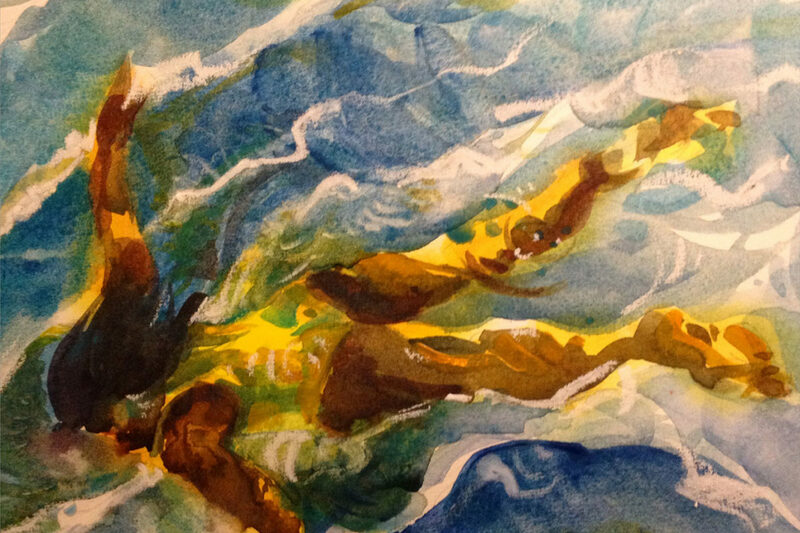 My favorite moment you create here is that wave at the bottom, directly below the swimmer. See how you’ve made the pure blue slowly transition to a near transparency, and you’re tone and value together are helping to define the piece. Nice work! 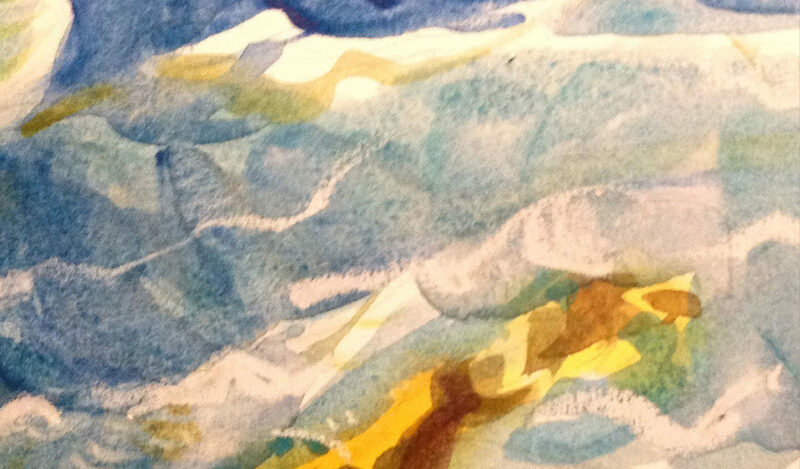 I think the colors are terrific, and as will happen in watercolor unfortunately they do get a little muddy at times. There are areas where all of your colors blend in ways that challenge the harmony – a way to fix this with future watercolors (believe it or not!) lies in a hair dryer. Every watercolor painting I make I have a hair dryer right next to my brushes! A quick dry and you establish much more control over where the colors bleed and where they go. You can even experiment with creating texture by drying the watercolor at different speeds! As Lauyrn mentioned, you’re sense of color is beautiful, the use of yellow in particular. The transparency aspect is a great point, by creating even more layers with color you can continue to develop unique depth of light by layering multiple fields of color over another to create your own expression of water. Playing with transparency and opacity in a more explicit way could be a very compelling direction to move in when trying additional pieces. I am particularly found of the suggestion of pattern on the swimmer’s swimsuit. You did an excellent job of suggesting the detail of a pattern without being so detailed that it would become a distraction. Great work! I’m thrilled to hear that you’re trying to apply your life-drawing approach to a painting from photo reference, as this is something a lot of people really struggle with… And for the most part, I think you succeed! 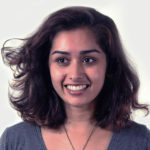 The piece doesn’t feel overly rendered, and in fact there are a lot of areas (like the foot Deepti points to in her critique) that are conveyed with a lovely, light touch – suggesting structure with very few marks. The only aspect of this painting that feels stiff to me is the composition, which could certainly be more dynamic and fluid, but the gesture of the figure, itself, is very loose and has a great energy to it! One of my favorite parts of this painting is the way the figure seamlessly integrates into the water, to the point that there are beautifully ambiguous areas where you cannot tell where the figure ends and where the water begins. You really get a tremendous sense of depth with the figure plunging downwards, the way that the head is obscured in the darkness makes the gesture of the figure even more mysterious. My recommendation would be to try to use the white of the paper more, to dramatize the lighting even further. The upper right hand corner seems like it could increase the sense of depth even further if that area had a more luminous, bright quality to it. I think in watercolor the temptation is to cover every single part of the surface of the paper, but I think the white of the paper can add a powerful sense of contrast if used well. I can tell even without reading your statement that you love color. You use that yellow as if it were liquid light, and I love the way it halos around the swimmer’s body. I do think you missed an opportunity to let your watercolors be what they are- water. 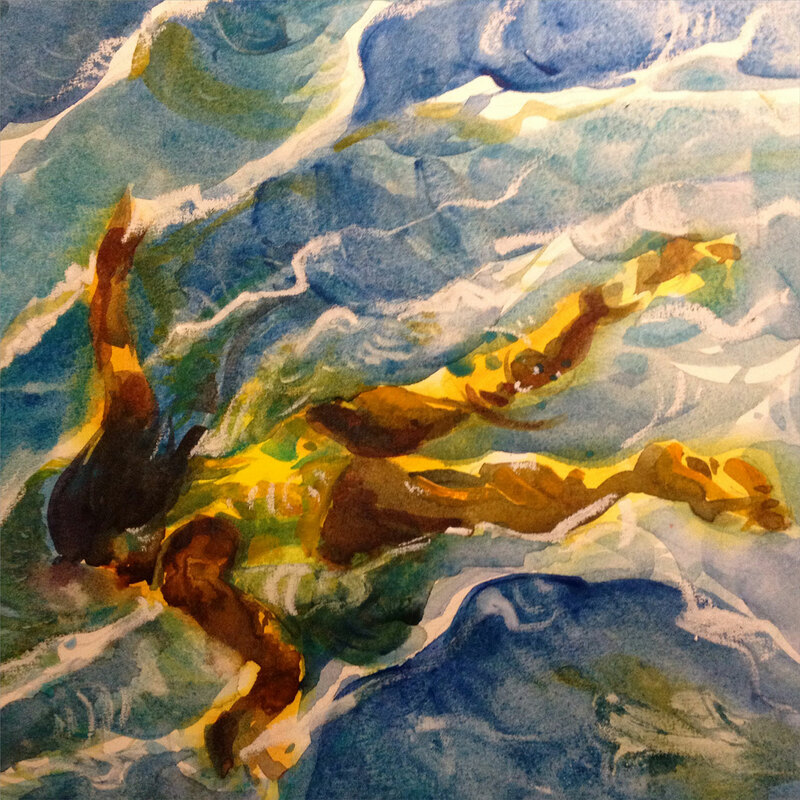 I’m looking for semi-transparent layers of swirling color over the swimmer like I would see in the ocean or in a pool, but your colors for the most part seem pretty bright and separated, which creates a kind of solidity where the swimmer looks like she’s laying on top of the water instead of penetrating it. 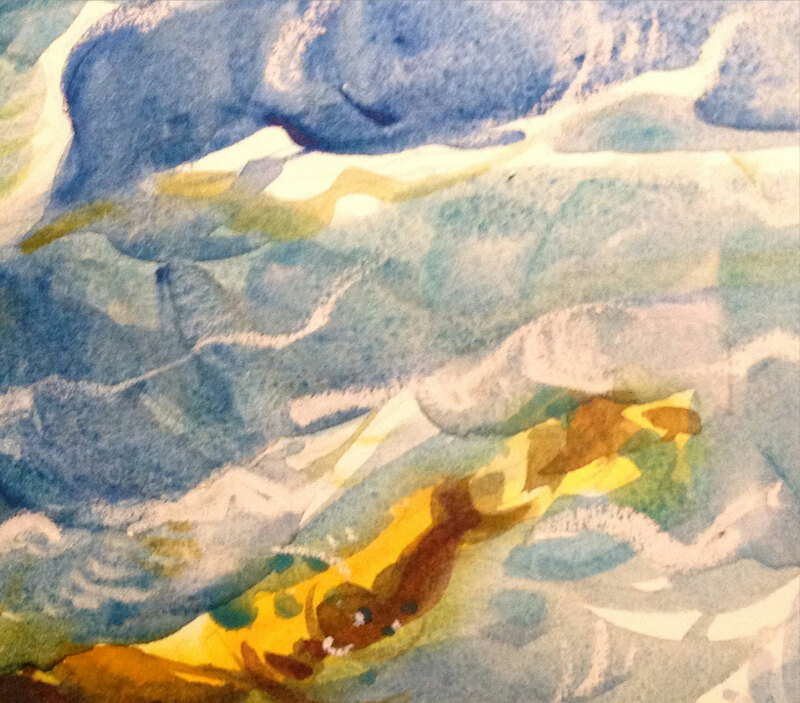 You might like Katherine Bradford’s swimmer paintings. 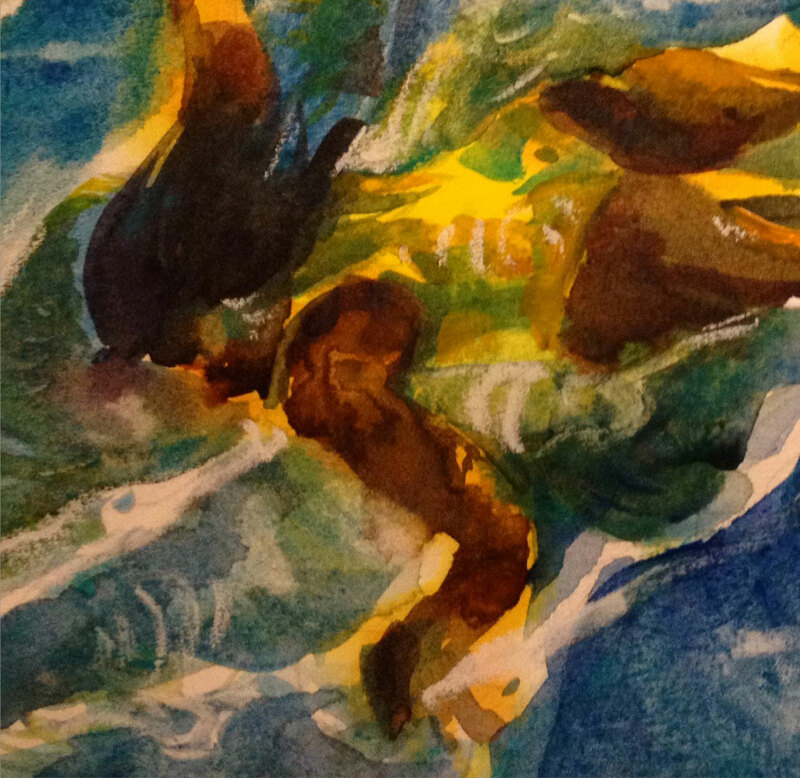 She also uses a lot of bright opaque color, but in a way that still reads as water and swimming.